The Noosa Festival of Surfing is the world's biggest surfboard riding event. 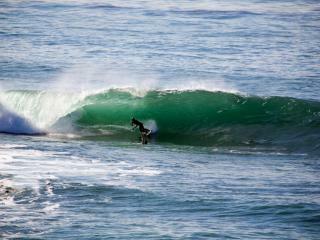 It is held at First Point Noosa Heads and it recognises the soul of surfing in one of the best surf locations. The festival attracts close to 500 surfers from aged 15 to the over 65's, they will participate in amateur, professional, teams and specialty categories. The Crick's Noosa Festival of Surfing features professional men's and women's events, 20 amateur divisions, team events and a new multi-discipline invitational event, the Jeep Waterman Challenge. Hosted by the Noosa Malibu Club, the festival village will be on the sand at First Point, Noosa Heads and will include a licensed beach bar, food stalls, live music and films, along with a surf product expo. The events featuring in the festival are the Vans Logger Pro; with the world's best traditional long boarders in action, the Classic Malibu World Tag Team Challenge, VetshopAustralia.com.au Dog Surfing Spectacular and the Seaglass Project Finless Pro. The first ever backpacker surf event will be held at the Noosa Festival of Surfing this year. The Mojo Surf Backpacker Challenge invites backpacker novice surfers from around the globe to undertake a crash course in surfing basics and then compete against each other over the first weekend of the festival. Ocean Addicts stand up paddles 'Super Sunday' will begin the Noosa Festival of Surfing on March 4. The three event stand-up division is anticipated to attract the best stand up paddle surfers of Australia. Ocean Addicts Super Sunday will include men's and women's open surfing divisions and five kilometre race circuit course on Laguna Bay.